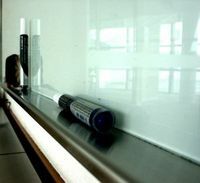 Managing student behaviour while writing on the whiteboard can sometimes be a challenge for teachers. Every time you take your eyes off the students, some take it as a signal to have a chat or misbehave. I saw a clever solution to this problem while observing a student teacher today. The teacher put some headings on the board before the lesson. But when it came to adding points arising from student contributions under the headings, the teacher orchestrated the discussion while using a student as her scribe to add the points to the board. This allowed the teacher to keep her eyes on the class more of the time and thus manage behaviour more effectively. It also added a nice extra touch of student participation to the lesson. I doubt if she's the first teacher to use this tactic, but it was the first time I'd seen it used. Definitely worth trying. At the annual state conference of the English Teachers Association of Western Australia in May 2008 I delivered a presentation on teaching students to be writers. Click the links below to view or download a copy of the powerpoint slideshow which accompanied my presentation and the handout I distributed.